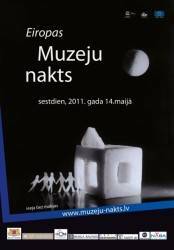 Very soon – in 14.may 2011 in Riga and other cities museums will be opened in the night – to fulfill Museum night events. Museum night in Riga is held for the seventh time and very happy for this tradition. The theme in this year – Neighbors. As you can feel, theme will be exposed as in narrow meaning about the neighbors nearby, as well as in global meaning. If you are in Riga and looking for where to go tonight, here are some guides.